HJ: When life gets intense, all kinds of deep mental and emotional patterns come bubbling to the surface and we are faced with the reality of those areas of ourselves that still need a bit of healing and work. And it can be very easy to slip back into old, self-defeating habits and patterns. In order to grow we must transcend and shift who we are being and how we are showing up in these moments of challenge. And this simple act rewires us in a fresh, new way that is equips us with the skills we need to be successful in future situations and at all times going forward. Master these 7 keys to staying strong and centered when life gets intense and you’ll shift your patterns and massively strengthen your happiness, peace of mind and joy. When life is “falling apart,” it could actually be falling together… for the very first time. Which is why it feels so darn uncomfortable. Consider that what’s in front of you may be serving you in valuable ways you don’t even understand right now. That’s the opening paragraph of an email I received last night from a reader named Kevin. His words remind me that sometimes you have to die a little on the inside first in order to be reborn and rise again as a stronger, smarter version of yourself. People and circumstances will occasionally break you down. But if you keep your mind focused, your heart open to love, and continue to put one foot in front of the other, you can recover the pieces, rebuild, and come back much stronger and happier than you ever would have been otherwise. Angel and I have dealt with our fair share of adversity over the years too – losing loved ones to illness, financial and business turmoil, etc. – and we’ve written a lot about it. But today, in light of Kevin’s email and a dozen other emails I’ve received this past week from readers who are struggling with hard times, I want to revisit and discuss seven key actions Angel and I take to find strength when everything seems to be going wrong. 1. 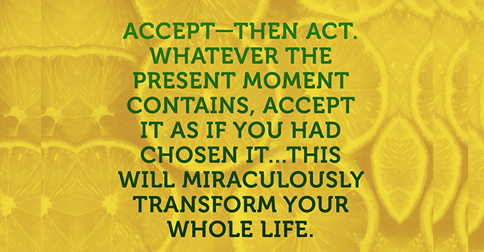 Fully accept the reality of what is. You cannot find peace by avoiding life. Life spins with unexpected changes every hour; so instead of avoiding it, take every change and experience as a challenge for growth. Either it will give you what you want or it will teach you what the next step is. Of course, this isn’t easy – it will be an ongoing struggle. But it’s infinitely easier than continuing to fight to conform your life to some antiquated delusion. It’s an infinitely more satisfying journey as well. When it’s working, when you can detach from those old images, there is peace, there is beauty, and there is happiness. 2. Remind yourself that everything in life is temporary. Every time it rains, it stops raining. Every time you get hurt, you heal. After darkness there is always light – you are reminded of this every morning, but still you often forget, and instead choose to believe that the night will go on forever. It won’t. Nothing lasts. 3. Push yourself to take another step, and another, no matter what. After studying the lives of many successful people, I’m convinced that about half of what separates successful people from everyone else is pure perseverance. In a culture that seeks quick results, we must learn the beauty of effort, patience and perseverance. Be strong, present and steadfast. The most beautiful smiles are usually the ones that struggled through the tears. Because breakdowns often lead to breakthroughs in the end. Every mistake, heartbreak and loss contains its own solution, its own subtle lesson on how to improve your performance and outcome next time. Thus, the most reliable way to predict the future is to create it yourself. Participate in life today instead of just watching it pass you by. Don’t let the few things that are out of your control interfere with the infinite assortment of things you can control. The truth is we all lose sometimes. The greater truth is that no single loss ever defines us. Learn from your trials. Grow wiser. Press on. In the end, good things don’t come to those who wait; good things come to those who are patient… while working hard, through good times and bad, for what they want most in life. It’s about courage. It’s about being scared to death and then taking the next step anyway. 4. Use positivity, rather than letting negativity use you. There may not be an obvious reason to be positive today, but you don’t need a reason. Being positive is a strategy, not a response. The most powerful time to be positive is precisely when everything around you is not so positive. Happiness in the long run is not the absence of problems, but the ability to deal with them. Raise your awareness to your own inner strength and positivity. You are in charge of how you react to the people and events in your life. You can either give negativity power over your life, or you can choose to be positive instead by focusing on the great things that are truly important. So talk about your blessings more than you talk about your problems today. 5. Focus on making tiny fixes. When everything is broken, it’s easy to find plenty of little things you can fix. When nothing seems to be going right, even the most fundamental positive effort can make a significant difference. Times of great adversity are also times of great opportunity. When there are problems in every direction, there is also great value waiting to be created. When everything is going well, it’s easy to get lulled into a routine of complacency. It’s easy to forget how incredibly capable and resourceful you can be. Resolve to persevere by making tiny fixes every day. It’s these minor tweaks that take you from where you are to where you want to be in the long run. Small steps, little leaps, and tiny fixes (very small repetitive changes) every day will get you there, through thick and thin. 6. Look for something small to appreciate. You may not have what you want, and you may be very hurt, but you still have more than enough to appreciate right now. Epicurus once said, “Do not spoil what you have by desiring what you have not; remember that what you now have was once among the things you only hoped for.” Meditate on this quote when life seems unfair. Remember that being positive in a negative situation is not naive; it’s a sign of leadership and strength. You’re doing it right when you have so much to cry and complain about, but you prefer to smile and appreciate your life instead. So don’t pray for the big miracles and forget to give thanks for the ordinary, simple, and yet not-so-small gifts in your life. It may seem strange to feel thankful for those events in your life that appear to be ordinary, yet it’s precisely by being thankful that you can transform the ordinary into the extraordinary. Think about it: What if you woke up tomorrow with only the things you were thankful for today? Think of all the beauty that still remains around you, notice it and smile. At the end of the day, it’s not happiness that makes us thankful, but thankfulness that makes us happy. Showing appreciation for the good things you have is the most powerful happiness boosting activity there is. 7. Give yourself the extra attention you need and deserve. Resisting and ignoring your own feelings and emotions does not serve you. It leads to stress, illness, confusion, broken relationships, fits of anger and bouts of deep, dark depression. Anyone who’s experienced any of the above knows that these states of mind are horrifically unhealthy… and when you’re in the habit of self-neglect, it’s near impossible to escape. You have to admit, to a certain extent, you have spent too much of your life trying to shrink yourself. Trying to become smaller. Quieter. Less sensitive. Less opinionated. Less needy. Less YOU. Because you didn’t want to be too much or push people away. You wanted to fit in. You wanted people to like you. You wanted to make a good impression. You wanted to be wanted. So for years, you sacrificed yourself for the sake of making other people happy. And for years, you suffered. But you’re tired of suffering, and you’re done shrinking. Right? Good! It’s not your job to change who you are in order to become someone else’s idea of a worthwhile human being. You are worthwhile. Not because other people think you are, but because you are breathing your own air, and therefore you matter. Your thoughts matter. Your feelings matter. Your voice matters. And with or without anyone’s approval or permission, you must be who you are and live your truth. Even if it makes people turn their heads. Even if it makes them uncomfortable. Even if they choose to leave. I can tell you from my own life experience that life is a wild ride. I’ve found happiness, lost it, found it, lost it and then I found it once again. But each time what I found was more incredible than the last. So remember that everyone suffers in life at some point. Everyone feels lost sometimes. The key is using your experiences to grow, inch by inch. When you apply what you’re learning to your future choices and actions, you move forward not backward. You become stronger and wiser. It’s not easy, but it’s worth it in the end.